I posted yesterday about one of the toughest issues facing Metro: reducing the number of fatalities along the Blue Line. While there has been progress in this area — the number of train-motor vehicle collisions has dropped significantly — the agency wants to keep making the line as safe as it possibly can be. A big challenge toward that end is increasing the enforcement of laws designed to keep motorists and pedestrians off the tracks when a train is present. There is no shortage of laws on the books and, yet, Metro officials believe there are still too many motorists and pedestrians taking unnecessary and illegal risks around the train. The above video, in fact, was taken by Metro officials — it’s part of a longer video on the Blue Line — and provides you a glimpse at the atmosphere around the Artesia station and some of the safety issues there. •As discussed in yesterday’s post, photo enforcement cameras are used along the Blue Line corridor, resulting in almost 50,000 citations being issued to motorists between 1995 and 2009. Common infractions include making illegal left-turns across the tracks and running red lights. 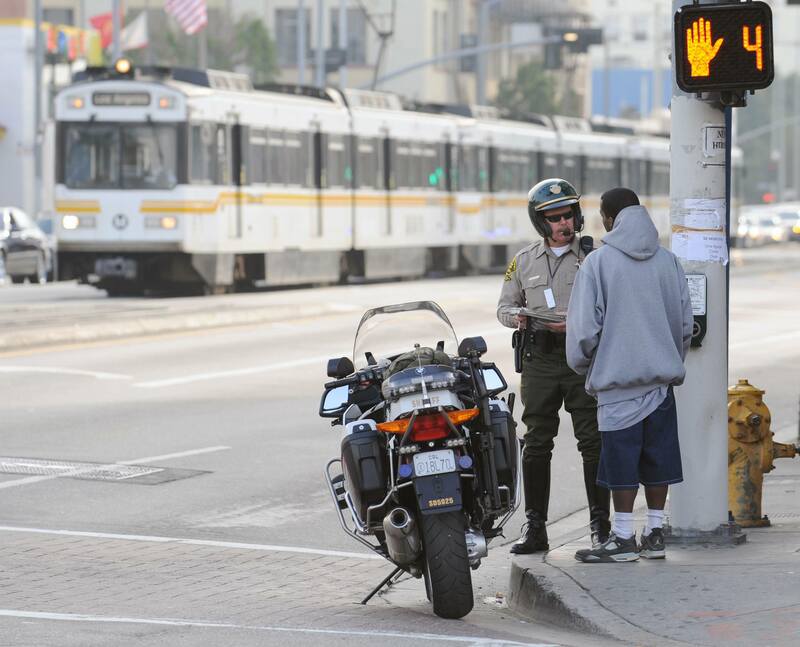 Police issued hundreds of tickets on Feb. 4 as part of a safety sweep along the Blue Line in downtown Los Angeles. Photo by Juan Ocampo. •Metro also contracts with the Los Angeles Sheriff’s Department for five officers to patrol the Blue Line corridor, mostly on weekdays. The officers issue citations to both motorists and pedestrians. In 2009, tickets were issued to 1,300 pedestrians and 6,900 motorists, according to Lt. Jenny Bethune. Pedestrians are often cited for failing to heed warning bells and signals and walking across the tracks. A red light violation will set motorists back $436; ignoring a don’t walk sign or jaywalking is a $175 hit to the wallet. •There are also periodic sweeps of the line by additional officers. On Feb. 4, in just a few hours, 31 Sheriff’s deputies and Los Angeles Police Department motorized officers issued 330 citations, 30 warnings and impounded 24 vehicles for 30 days along the street running segment of the Blue Line between Washington Station and 7th/Metro Center in downtown Los Angeles. Hint to motorists: There’s another similar sweep along the line scheduled very, very soon. Consider yourself warned. •Metro is also putting two “Rail Safety Ambassadors” on the Blue Line for the next few months. The ambassadors — retired bus and train operators — have previously been used on the Gold Line. Their job is not to enforce the laws, but rather to encourage safety, answer questions from passengers and community members and report their observations back to Metro safety officials. Bethune said officers, in particular, see two dangerous activities from pedestrians. In the first, walkers are so focused on a train coming from one direction they’ll forget to check the other direction before walking across the tracks. In the second, people tend to dash across the tracks because they’re in a hurry, oftentimes trying to catch a train. Bethune also encouraged community members to call the Sheriff’s Department if they see unsafe behavior around the tracks. The dispatch phone number is 323-563-5000. In Monday’s post, we’ll take a look at some of the efforts being made by Metro to educate communities around the Blue Line about how to safely drive and walk near the train. If you have a comment on this post, please email us at thesource@metro.net.